John and Tricia Christian started Boquio Iron & Glass in 2000 bringing together the two crafts of hand forged wrought iron and stained glass, both steeped in centuries of tradition. This unique team produce a wide range of work in wrought iron and stained glass to an extremely high standard of craftsmanship. The wrought iron and stained glass is strongly influenced by the vibrant and natural Cornish scenery that surrounds their home at Lower Boquio Farm. Lower Boquio Farm, dating from the 17th century, has an enduring quality that influences the traditional wrought iron and stained glass designs. Complementing the traditional, John & Tricia's diverse range connects to present day as demonstrated by their contemporary wrought iron and stained glass pieces. Pronunciation: bo-kwai-oh ~ the rare Cornish name meaning 'dwelling in the hollows'. 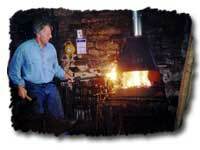 All Boquio wrought iron work is traditionally hand forged in the fire using centuries old techniques. John has successfully completed a traditional blacksmithing apprenticeship with the Countryside Agency at Hereford College of Technology, the award being endorsed and presented by the Worshipful Company of Blacksmiths. As an artist blacksmith, John can produce anything in iron from hand forging his own tools to clients' specific commissions. As well as traditional blacksmith reproductions, John's wide range of work includes contemporary wrought iron designs, sculptures and garden art. 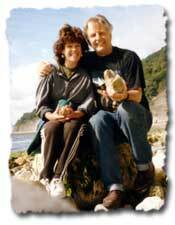 John is a member of the British Artist Blacksmiths Association. Regularly demonstrating wrought iron work, John brings a much-needed awareness of the profession to the public. He also teaches traditional blacksmithing techniques at the Lower Boquio Farm forge. 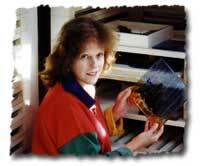 As a glass artist Tricia Christian, MA~Glass, has pushed out the boundaries of stained glass working extensively with artistic glass creations formed in the kiln. A member of the Cornwall Crafts Association, Tricia is developing her own distinctive designs in fused glass bowls, plates, hangings and garden art. Tricia teaches the traditional stained glass techniques of both lead and copperfoil, running successful stained glass courses at her studio as well as at clients' premises. She also gives demonstrations of stained glass bringing awareness of these time-honoured procedures to the public. Copyright © 2003 Boquio Iron & Glass. All rights reserved.